"I read The Dragons of Rosemar very early on, and was struck by what an exciting and complex story it was shaping up to be. D.S.Patrick is a true story-teller, and many fantasy readers are sure to fall under its spell." Trouble is coming to the land of Rosemar, but who can save the kingdom from falling into the hands of the dark warlord? Does the fate of the kingdom rest in the hands of a mere kitchen boy? What possibly could 17-year-old Daniel have to offer the Kingdom of Rosemar? Scrubbing pots was all he knew, having come from a poor family. Unlike his father, he knew nothing of being a soldier, nor did he know anything about magic or what went on behind the gates of the Dragon Quarters. Yet, he was approaching manhood and would have to choose how to best serve the kingdom. The possibilities seemed inconceivable, what choices could a poor kitchen boy possibly have? It seemed the odds were against him, was he doomed to remain a simple kitchen boy? Only fate will decide, as Daniel is taken on an incredible adventure when he discovers three strange objects and a dragon that will change his life forever. D.S. Patrick's lifelong love of fantasy books and role playing games inspired him to write his first novel. He was born in New York where his younger years were spent playing Dungeons & Dragons. He has always been fascinated by the aspects of fantasy; from dragons to wizards and everything in between. D.S. Patrick served in the military for over twenty years, where he learned good fighting strategies that helped him to write his novel. Being in the military also taught him leadership skills, how to command troops, and problem solving techniques. D.S. Patrick has also been a cook for over thirty years. Daniel is just a kitchen hand. Though working in the kitchen is looked upon by many of the other citizens of Rosemar as a "poor man's job," Daniel is just happy to have someplace warm and comfortable to spend the cold winter months. However, at almost 17, Daniel will have to make the decision about what he will do for the kingdom as an adult. Work with the mage? Become a dragon trainer? Or maybe a soldier like his father? The thought fills him with confusion, but it turns out he might not have to make that choice. Daniel embarks on a mysterious adventure, learning who he is, growing up, and meeting a dragon which all helps determine his life. D.S. Patrick makes a name for himself in young adult fiction with Dragons of Rosemar, a fun and fascinating fantasy tale. I enjoyed the simplicity of this book. D.S. Patrick wrote a simple, entertaining, adventure story with a boy's coming of age story at its heart. 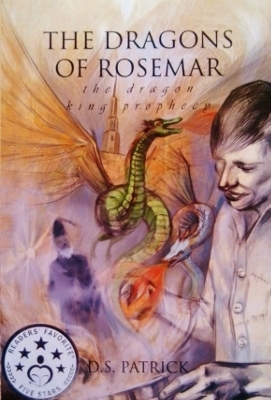 The Dragons of Rosemar has a lot of the common tropes of fantasy: a young semi-orphaned boy, having to rely on himself and his strengths to get him through the hard situations that life has thrown his way. Despite this being a pretty typical fantasy story, there were a lot of fun and interesting aspects that made the book truly enjoyable as well. The traditional fantasy elements were well written and well played, and I really loved the scenes with the dragons! The Dragons of Rosemar is a thrilling, intriguing fantasy novel that will keep you engrossed, entertained and enchanted until the very last page! This sensational book is phenomenal and addictive… so much so that I found it unputdownable. I was impatient as I moved from one page to the next and that is all thanks to the astonishing author’s engrossing literature, riveting plot and let’s not forget extraordinary characters! All of these factors combined The Dragons of Rosemar the perfect fantasy read to escape into! The story of this incredible book takes the reader on an adorable journey that will take its readers on an unforgettable journey. The story of this book is glorious and breath-taking. The novel has a plot that has surprised me more than once thanks to its captivating and absorbing nature; one thing is for sure when you read The Dragons of Rosemar and that is you will never be bored! Reading this book is a gem because it is a diverse all-consuming assault of brilliance that will keep you motivated to read until the very end; it is like the author has a binding spell on you and the only way to break this spell is to immerse yourself in the layers of the novel! I found the story of this brilliant tale to be unique and dynamic. It took my breath away thanks to the epic fantasy the reader encounters along this mystical journey. It is a wonderfully executed story that was expertly plotted. I did not get bored at any given time reading this book. I always measure my likeness of a book on whether I find myself looking at the page number but never once did I with this novel because it is epically brilliant! To summarize my thoughts on the thrilling novel that is The Dragons of Rosemar; I would say if you are a reader who is tired of reading the same old books that are lackluster and forgettable then take a chance with this one because I promise you now that you will not be disappointed! It has everything a reader would want in a fantasy novel; it has captivating characters, great literature, and an all-consuming plot. This thrilling adventure gets Five Stars! Thank you so much for reading book lovers, I deeply appreciate it and love discussing wonderful books with all of you so please, comment below and let me know your thoughts on The Dragons of Rosemar; do you see yourself reading this book? Is it not your usual cup of tea? Let me know all of those brilliant thoughts of yours below! Thank you so much again for reading!